Braiding is such an easy technique to use for jewelry making as shown by these creative individuals. Their tutorial approaches were all different but the resulting jewelry is nonetheless fun and unique. 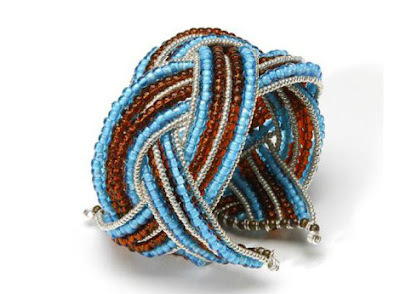 Marie Vetrano designed this gorgeous wire work braided bracelet tutorial varying color and bead shapes to great effect. This tutorial is on Michaels' site. Click here for a selection of their lovely necklace tutorials. Michele over at The Scrap Shoppe blog called her eclectic braided bracelet (above) a hot mess. I definitely agree with her - it's in a good way as it looks really glamorous. Braiding with a large link metal chain is a cool idea. This mixed media bracelet tutorial using embroidery floss is by Stephanie over at Henry Happened. Stephanie also has a different take on the ever popular wrapped leather bracelet design. She used colored cord and beads for her tutorial. Pop over to her blog and you will see how she wears it - as a necklace and as a bracelet. 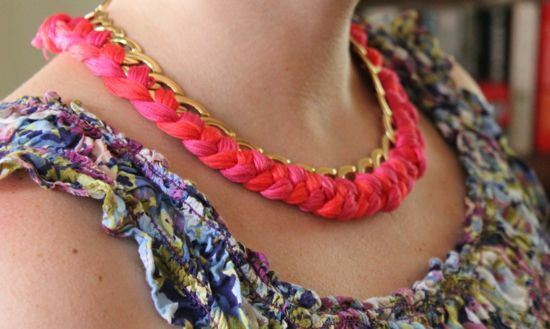 Knitting fans will love OlgaJazzy's cable braided necklace. It's a very clever design because you don't actually do any cabling. You knit just two long strips. Choosing the right yarn that doesn't tickle is also critical. 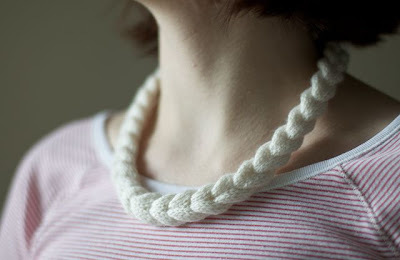 Soft cotton or bamboo yarn may be an option. The button closure means the necklace can be wrapped around the wrist too! Jessica over at the ECab blog posted this really easy braided bead strands necklace. It's from a while back and was featured on Pinterest. But a great idea is always perennial! 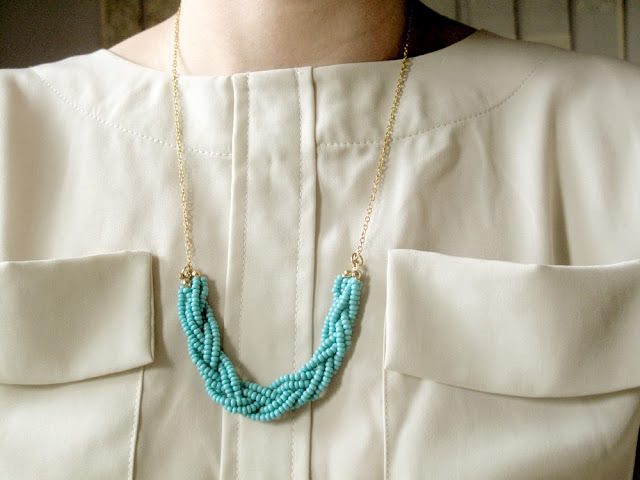 Steph and Trish over at Le Fanciulle were more ambitious with their braided seed bead stranded necklace tutorial as it goes all the way around. Neat recycling tip using pen nibs as the conical beads!! 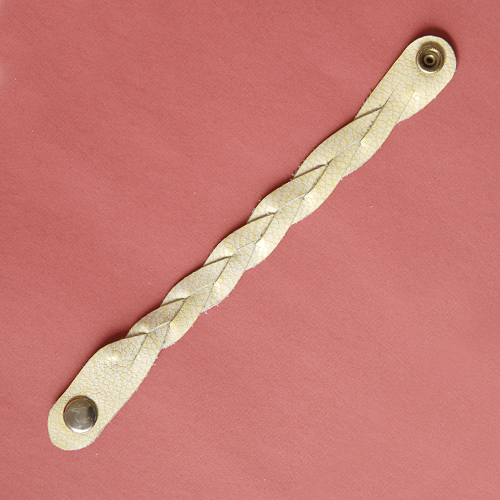 Melissa Espin of I Still Love Youp's magic braided leather bracelet tutorial looks simple right? But look again and do you see why she called it "magic"? Brilliant! Melissa's bracelet is so cool I had to immediately click on the link to see how she did it! Great tutorial and most annoying because now leather is added to my "must learn" list, which is longer than my lifespan. Sometimes I have to do it two or three times because I can't understand the letters. You and me both! Too many neat things to try.